[twitter]Krause Berry Farms opened up officially for the season today, and for $1.50 a pound you can fill your face and freezer with the best, ripest, freshest strawberries you can find in the world. The 100 mile diet is all the rage. Fresh food picked the day you ate it from the neighborhood you live in. 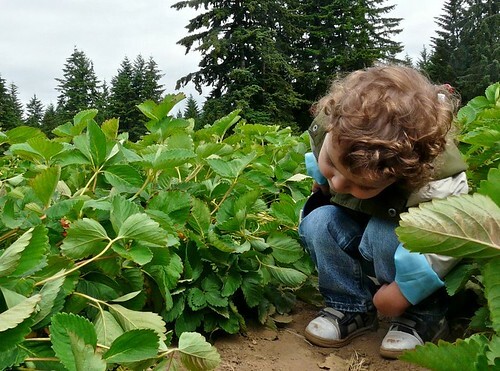 50km from our house in North Vancouver is the Langley farm fields that will be filled with strawberry pickers this weekend as the Strawberry Season is officially underway. 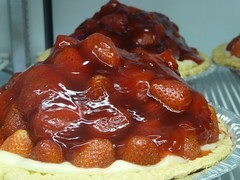 When I was younger, I used to hit the U-Pick Strawberry fields in Richmond and harvest all through June. I’d pay 35c a pound for the berries and I my dad would turn around and sell them for 75c a pound to his colleagues at work. It was cheaper than the grocery store, and my first kick at entrepreneurship. I did the same each summer with blueberries which grew wild behind our house near 4 Road and Francis. I’d get about 5 pounds and hour picked that my dad would sell at his office for a pure profit of 75c a pound. It was a good racket. 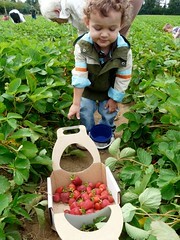 Now I’m off to teach Zacharie the U-Pick habits of harvesting the freshest food for your table. We spent about 30 minutes taking photos, riding the tractor and sampling the sweetness and managed to scoop a quick 8 pounds of bounty amongst myself, mom, grandma and grandpa. Zacharie helped too! Check out BC Farm Fresh for a farm near you, although I’d seriously recommend Krause Berry Farms for some strawberry milkshakes, strawberry shortcakes and strawberry picking fun. ← Do Square Watermelons Taste Better? Do Square Watermelons Taste Better?